The Western Sahara, given its name in 1975 by the United Nations, is the last African colonial state still to declare its independence. It extends over 285,000 square kilometers of predominantly sandy plains. The Western Sahara's map borders are a result of colonial agreements made between France, Spain and Morocco in 1900, 1904 and 1912. But the sandy Atlantic coast to the west, the Quarkziz and Oued Draa mountain chain to the north and the barren desert to the east and south form natural boundaries to the region. The Western Sahara, located on the north west coast of Africa borders Morocco to the north, Algeria to the east and Mauritania to the south. The region is yet to declare independence. While mainly low lying sandy plains the region can be roughly divided into three topographical zones: The steep mountainous rocky desert, formed by the chain of Atlas mountains and the hills of Zemmour, forms the north east zone. The river basins of the wadi Draa to the north and the Jat to the west where water gathers in the depressions during the brief autumn rainy season forms the second zone. Here the high temperatures and evaporation rates mean that the water never reaches the sea but sufficient moisture is retained along the edges of the rivers for cattle grazing and some cereal cropping. The third, inland, zone consists of flat low lying plains of ergs and sand dunes. The ground is too porous for water to retain the autumn rain, and too flat to allow it to flow, so it accumulates underground in numerous wells. Inland the climate is typically continental - extremely hot summers (with temperatures reaching over 60 degrees celsius in the shade) and cold dry winters. A mixture of indigenous Berbers and Arabic tribes the Saharawi peoples' direct ancestors can be traced back to the XVth century when tribes from the Yemen crossed North Africa establishing themselves in the region later to be known as the Western Sahara. The difficult environmental conditions, cold dry winters, scorching summers, low irregular rainfall and rough terrain encouraged the different tribes to coexist and live together. Later, the acceptance of Islam by the berbers and the increasing strength of the arabic culture gave the tribes people a predominantly Arabic bias. As a result of this mixture of tribes the Saharawi people and culture was born. The struggles of the twentieth century against Spain, Morocco and Mauritania saw a strong Saharawi nationalism develop. In the Saharawi tribal culture no tribe exerted any direct or indirect power over any other and each one was represented in an overall governing body called the Assembly of Forty. Disputes were handled either in a friendly way or by compensation according to Islamic laws. More serious disputes were taken to the counsel of the chiefs of tribes, called Ait Arbein. To this day a similar organised structure exists in the administration of the refugee camps. 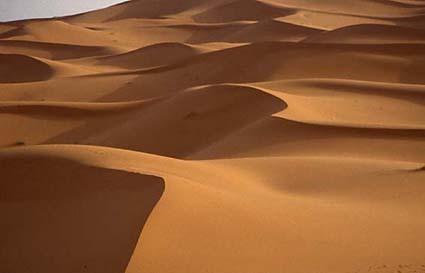 Until the 1960s the Saharawi people were essentially nomadic, pasturing cattle in the sandy low lying plains. They moved in accordance with the seasons, their routes dictated by wells and watering holes. But during the 1960s the Saharawi became increasingly sedentary. It was during this time that Saharawi nationalism grew in strength. The difficult economic situation and the exploitation of the natural resources by Morocco and Spain marked the birth of the first Saharawi political movement claiming independence from Spain. The political movement, although banned in 1970, and Saharawi nationalism has grown in strength and binds the Saharawi people together in the struggle for self determination. Enabling us to improve the quality of the content, if you have additonal information, remarks or suggestions, please share it with us by e-mail.